Energy Dynamics: Let the Consumer Advocate & PUC Do Their Jobs! Let the Consumer Advocate & PUC Do Their Jobs! Yesterday's press conference held by some politicians need some good follow-up questions by journalists. Questions like: It's so easy for you just to say no to the merger, so have you mapped out a serious alternative strategy to reach the 100% renewable portfolio standard objective? If so, how much is your alternative strategy going to cost? As the public ownership option and dissolution of the franchise are solely in your hands what would be the timeframe for such a proposal? What would be the opportunity cost for switching to a new ownership model? 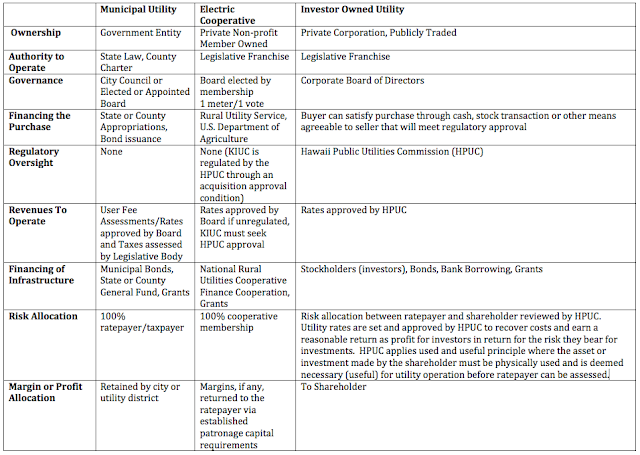 Other than the Hawaii Island Energy Cooperative, what other non-profits have been formed to seriously look at cooperative models for Molokai, Lanai, Maui and Oahu? If none, what will it take to form a credible non-profit to move forward, and again what would be the opportunity cost? Do you understand that in these alternative models all risks is transferred to the electricity customer and taxpayer? How do you feel about that? Or, what matters most, how do your constituents, who will be carrying 100% of the risk, feel about that? And, the threshold question, are you willing to put State or County's money where your mouth is? Who is going to upfront the money for a serious look at cooperatives? I guarantee it's just lots of big talk and just more studies. These people have very little understanding how much it will cost, where to start and what it will take to run an efficient and financially viable electric utility during a technological disruptive period. As these politicians spew their "beliefs" - and that's just what it is, rhetoric not based in critical analyses or an understanding of utility operations or regulation - they create an unstable regulatory environment and business climate which has the potential to send up red flags and wreak havoc on HECO's ability to finance its operations with or without the merger. During this time of transformation a well-functioning electric utility requires insightful leadership, nimble and flexible strategic planning and strong analytical capacity. 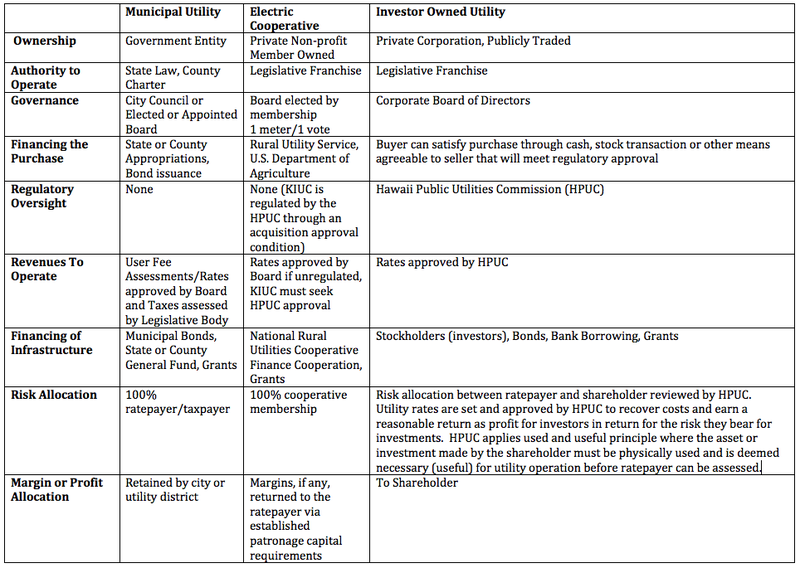 A particular ownership model does not guarantee any of these characteristics or qualities required for an electric utility to successfully navigate an energy transformation and may, in fact, hinder it with decisions based on politics and the need to weigh competing interests rather than fact, technology, economics and best practices. This is why these politicians and the Governor need to let the Hawaii Public Utilities Commission, as the regulator, and the Consumer Advocate, whose statutory duty is to represent the interest of Hawaii's ratepayers, to do their jobs in evaluating the application and all the questions and responses to come to an evidence based decision that is in the public interest. This issue of risk transfer is widely misunderstood. In the worst utility catastrophes of the past half century, ratepayers have absorbed the vast majority of the risk when investor-owned utilities have failed. And have not always absorbed the risk when public power utilities have made failed investments. The most extreme cases are those of Public Service Company of New Hampshire and Long Island Electric Company. Both invested in nuclear plants (Seabrook and Shoreham) that devoured capital and provided little or no return. In the case of Seabrook, the bankrupt company was sold to Northeast Utilities, and ratepayers paid for nearly all of the excess investemnt. In the case of Shoreham, a public power utility had to take over, because the investor-owned utility was inviable, and the public needed electric service; but ratepayers again paid for the dead nuke. At the other end of the spectrum is the $2.25 billion bond default on the failed Washington Public Power Supply System (WPPSS) units 4 & 5. Ratepayers ultimately had to pay one-third of the cost of the bond default. And, despite warnings to the contrary, there was no long-term adverse impact on the borrowing rates for the individual public power utilities who signed the contracts, and WPPSS has been able to refinance the debt on the first three units at very attractive rates. Yes, there is a shift of risk. But the tradeoff is substituting 10% utility cost of equity and 6% utility cost of debt (and average rate of return of 8% (plus federal income tax) for 4% municipal bond rates (with no federal income tax). Anyone who has refinanced a home mortgage knows what a difference in payment a 4% mortgage can make compared with 8%.